The geography of the industry is not at a standstill, though. The top ten world producers are unchanged from the previous year but, continuing a trend that comes from 2013, China lost 2 percentage points in its production share last year, with Asian countries such as India, Vietnam, Indonesia, Turkey and Bangladesh, as well as Brazil, reinforcing their own share. In fact, China’s share in the world production, which has increased in a sustained way in the last few decades, peaked in 2013 (62.9%), and since then has declined steady to a 57.0% quota in 2016. 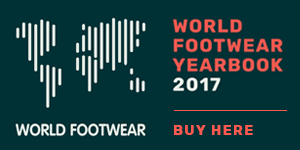 The World Footwear is a project developed since 2011 by APICCAPS, the Portuguese Footwear, Components and Leather Goods Manufacturers' Association. As part of this initiative, APICCAPS just launched the 7th edition of the World Footwear Yearbook, which analyses the most important trends within the worldwide footwear industry. Statistics are presented to year 2016 both in quantity and value, giving a picture of the positioning of the main players in terms of production, consumption, exports and imports. The publication also includes individual analysis of dozens of markets.